The early 20th century was when we started extracting and burning fossil fuels on a large scale. It stands to reason that the effects would be evident. I am not talking about what scientists thought in 1920. Well you may consider that it "stands to reason" but the IPCC states that global emissions would only have a significant effect on climate from about 1960. The fact that models to NOT reproduce the early 20th c. warming and that the IPCC carefully crafts it's public statements to a convenient "latter half of the 20th century" reflects the fact they are trying sweep this inconvenient fact under the carpet. - and these models, have increasingly been shown to have erred by being overly conservative. In terms of "global warming" averaged results of IPCC referenced climate models have OVER-estimate the warming since 1990 by about a factor of two. The one thing they had under-estimated was the rate of warming in the Arctic. However, the fabled "ice free summers" have been pushed back from "in 5 years" by Al Gore in 2007 to .. maybe 2050 ( ie long after the proposer has retired or died ! ). I never stated I thought everything should be linear you are attempting to put words into my mouth. That is the biggest problem with mainstream climatology and public perception of it: everything is a "trend". What is a "trend" it is a straight line fit which is the spuriously assumed to be reliable predictor of the future and extrapolated way outside the period of reference. You seem oblivious the the self contradiction in what you wrote. Arctic sea ice did accelerate significantly between 1997 and 2007 , in 2007 that was cause for legitimate concern. There was an assumption that this acceleration would continue and much talk or "tipping points" and "run-away melting". However, the last ten years of detailed observations contradict that assumption. Science is supposed to be self-correcting in the face of observation but both scientists and media have gone very quiet about the unexpected good news that we have not reached a tipping point in the Arctic and accelerating melting has decelerated to the point where there has been no net loss in the ten years since IPCC's AR4. 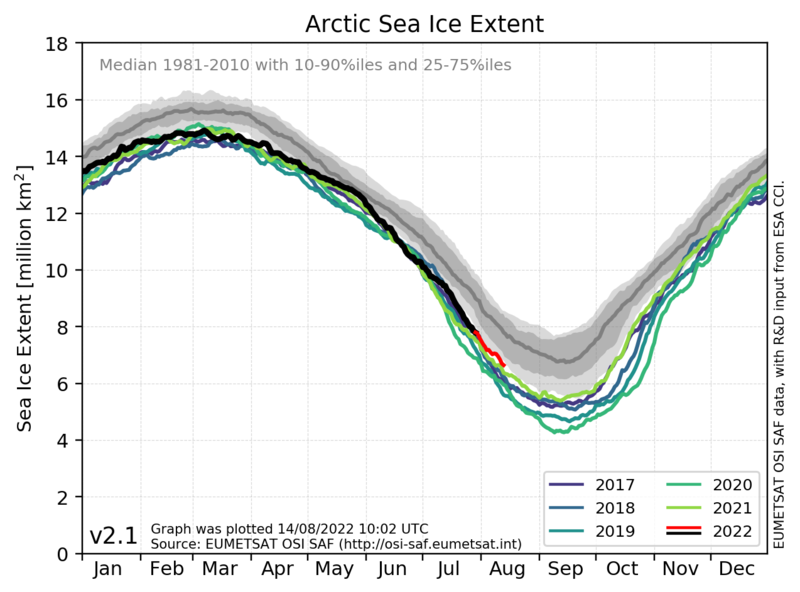 If you expect everything to be "perfectly linear" , something you warn against, you can still draw a downward straight line through the limited period of the satellite ice record. However, that line will be less steep that the line you would have got in 2007 because melting has DECELERATED, not accelerated as everyone expected. That means that either scientists are fundamentally wrong about the assumed positive feedbacks ( more open water , more heat , more melting ) and in fact the arctic ice is stabilising at a new lower level, or there is some other process which is the primary driver in the Arctic - again we have a serious lack of understanding of the basic processes. There are many environmental issues we need to take care of down on the ground. Those obsessed with an invisible, non toxic trace gas are being distracted into looking at the sky to prevent them seeing what is happening closer to the ground. This idea that you can explain the massively complex climate system by a trivial one variable answer is naive to the point of stupidity. Sadly a whole generation has now grown up being force-fed this trivial pseudo-scientific baloney since kindergarten. They have been thoroughly indoctrinated. This now seems to be an article of faith for anyone who sees themself as left of centre. It has become a political tribal badge. I used to consider myself leftwing but that has become too embarrassing of late. I consider my allegiance to the scientific method more important than the swings and roundabouts of politically correct doctrine. So on the one hand, you still believe we're in an ice age, because observations of the distant past show that glaciations tended to recur at intervals of 50,000 years or so, and that nomenclature developed by geologists before climate change was recognized must be accepted as describing our present situation. And even though we've entered into a period of unprecedented warming not seen for millions of years, you're still afraid of the earth becoming a dead frozen ball (when?). You tell us that "science must be self-correcting" but apparently not to the extent of recognizing the end of a theoretical "ice age" that's manifestly over. On the other hand, you're telling us that because there was a brief interruption in the rate of Arctic sea ice retreat 12 years ago (which has since resumed), the scientific consensus on the effects of greenhouse gasses in the atmosphere is all wrong, even though you admit there are more variables involved.than that. You claim allegiance to "the scientific method", but reject the findings of actual scientific studies, the vast majority of which don't happen to agree with your predetermined position, claiming they are all "pseudo-scientific baloney". So which is it? Do you believe in science, or not? Are long-term trends really invalidated by short-term fluctuations? Is the recent news about increasing ocean temperatures https://www.nytimes.com/2019/01/10/c...te-change.html , accelerated polar melting https://www.usatoday.com/story/news/...ng/2575410002/ , https://www.washingtonpost.com/energ...=.e8a8e4bf2581 and unexpected revisions in climate models https://phys.org/news/2018-07-global-climate.html really all good, because it's leading us to that "green paradise" Earth you told us about? It's unfortunate that rejection of scientific climatology (and science in general) has become a badge of tribal identity for the right wing in the US, American centrists of both parties used to be able to accept scientific evidence and use it to formulate public policy. Science, after all, is the foundation of the prosperity and power that America now enjoys. If we really turn our backs on it now in favor of wishful thinking, we'll deserve the fate that is rapidly creeping up on us. And even though we've entered into a period of unprecedented warming not seen for millions of years, you're still afraid of the earth becoming a dead frozen ball (when?). If it happened before, it is not "unprecedented". You are confusing your hyperbolae and you are are woefully ill-informed ( probably because you seem to rely on the alarmism pushed by the media). The medieval warm period; the Roman warm period and the Minoan warm period were all warmer than today and did not happen millions of years ago. It is amazing the hysteria which is whipped up from 0.7 deg C per century warming , of which half is allegedly attributed the human influence. I suggest you try reading published papers rather than rehashed snippets by biased and scientifically illiterate journalists trying to do their bit to "save the planet" by exaggerating and twisting the facts. You should also note that a paper is just an opening of scientific discussion, and does not constitute its claims being cast in stone. The climategate emails revealed some very unscientific "gatekeeping" preventing alternative evidence getting published. There is a heavy left wing bias in academia which is stifling objective investigation of climate. A new study based on evidence from past warm periods suggests global warming may be double what is forecast. Future global warming may eventually be twice as warm as projected by climate models and sea levels may rise six metres or more even if the world meets the 2°C target, according to an international team of researchers from 17 countries. Note all the suggests and may be's , not a very scientific "finding". It says if we meet the 2°C target, warming "may be " twice as much. 2 = 4 , WTF? The warming of the first two periods was caused by predictable changes in the Earth's orbit, while the mid-Pliocene event was the result of atmospheric carbon dioxide concentrations that were 350-450ppm – much the same as today. More pseudo scientific balonly. Making such definitive claims is totally misleading. We do not even understand modern climate, how can they make such claims about the past? In the paleo record CO2 increases with a lag of 200 to 800 year AFTER temperature rises. That makes it rather difficult to pretend that CO2 was the cause. This just shows the corruption of the science and media outlets you are taking as your sources of information. Where on Earth do you get that from. That is not what I said and is not what is happening. Of the limited period of about 40y of the satellite record, most of the loss of Arctic sea ice happened between 1997 and 2007, one of the short periods you dismiss as weather. Since then a similar ten year period has shown no net change. Where is your "resumed" melting ? You may be confusing north and south. Since Arctic stopped working as the "canary in the coal mine" the media , rather than report to good news that he "run away melting" has stopped, just stopped talking about it and switched to discussing Antarctica, which they had previously ignored because the sea ice area was increasing while the north was decreasing. West Antarctic ice sheet is losing volume, East Antarctic is gaining volume. Measurements are limited and depend upon subject model choices. Interpretations vary wildly and can be completely contradictory. Anyone making definitive claims about current ice loss and that of 40 years ago simply making it up. We did not even have the current inadequate level of measurement back then. Sadly folks already convinced that the world is coming to an end accept such claims unquestioningly and add another layer of "OMG , it worse that we thought". That is part of what is called bias confirmation. Don't just read the headlines, get the papers, read them and read them critically. Often the content of the papers are much more honest about uncertainty than the sound bites selected authors give to journalists. Anything full of "could be", "maybe", " as much as" claims is speculation not science. You need to look at DATA not breathless media outlets with an axe to grind and little scientific training. Here is the official Danish govt ice record. 2016-16-17-18 , where is the resumed melting. There is a whole raft of official data sources to be found here , US govt, Danish, Norwegian, Japanese, all actual official sources , take your pick. Here is the Arctic sea ice volume from the European Cryosat2 mission, specifically launched to measure volume rather than area. No "resumed" melting there either. You are misinformed if you think that Arctic sea ice melting has resumed. Yes, sadly, low intellect folks on all sides like to reduce everything to a simple binary , black/white, choice. However, rejection of climatology is the fault of the scientists themselves who have largely abandoned scientific objectivity and see no conflict in coming out as "activist scientists". the end of a theoretical "ice age" that's manifestly over. You are out on a limb with that claim. Get a grip. Manifestly there are still huge ice caps at both poles. Changes between glacial and interglacial stades of an ice age involve swings of 5- 10 deg C in global temps; most of the current interglacial period was much warmer than it is today. 0.7 deg C rise in temperature does not redefine geological epochs. > And even though we've entered into a period of unprecedented warming not seen for millions of years, you're still afraid of the earth becoming a dead frozen ball (when?). > If it happened before, it is not "unprecedented". You are confusing your hyperbolae and you are are woefully ill-informed ( probably because you seem to rely on the alarmism pushed by the media). > The medieval warm period; the Roman warm period and the Minoan warm period were all warmer than today and did not happen millions of years ago. It is amazing the hysteria which is whipped up from 0.7 deg C per century warming , of which half is allegedly attributed the human influence. > I suggest you try reading published papers rather than rehashed snippets by biased and scientifically illiterate journalists trying to do their bit to "save the planet" by exaggerating and twisting the facts. You should also note that a paper is just an opening of scientific discussion, and does not constitute its claims being cast in stone. The climategate emails revealed some very unscientific "gatekeeping" preventing alternative evidence getting published. There is a heavy left wing bias in academia which is stifling objective investigation of climate. While we have good data about global temperatures now, this can't be said for the reconstruction of temperatures in the distant past, which must be done by correlating clues from tree rings, ice cores, lakebed sediments, etc. So any speculations about past periods must be met with some skepticism, more so as they recede in time. I couldn't find much about the "Minoan Warm Period", but there is some discussion of the so-called Medieval Warm Period available online. This seems to have been a local phenomenon in Northern Europe rather than the sort of global climate event we're experiencing now. If you're really interested in the published papers, here's one in Nature that shows this: https://www.nature.com/articles/ngeo1797 by a panel of 78 scientists with expertise in the techniques used around the planet to reconstruct past climate data (all left-wingers, no doubt, in league to defraud people out of their cars). > A new study based on evidence from past warm periods *suggests* global warming *may be* double what is forecast. > Future global warming may eventually be twice as warm as projected by climate models and sea levels may rise six metres or more even if the world meets the 2°C target, according to an international team of researchers from 17 countries. > Note all the suggests and may be's , not a very scientific "finding". It says if we meet the 2°C target, warming "may be " twice as much. 2 = 4 , WTF? > The warming of the first two periods was caused by predictable changes in the Earth's orbit, while the mid-Pliocene event was the result of atmospheric carbon dioxide concentrations that were 350-450ppm – much the same as today. > More pseudo scientific balonly. Making such definitive claims is totally misleading. We do not even understand modern climate, how can they make such claims about the past? In the paleo record CO2 increases with a lag of 200 to 800 year AFTER temperature rises. That makes it rather difficult to pretend that CO2 was the cause. This just shows the corruption of the science and media outlets you are taking as your sources of information. > Where on Earth do you get that from. That is not what I said and is not what is happening. Of the limited period of about 40y of the satellite record, most of the loss of Arctic sea ice happened between 1997 and 2007, one of the short periods you dismiss as weather. Since then a similar ten year period has shown no net change. Where is your "resumed" melting ? I'm glad you are aware of it at least. There were 10s of thousands of emails, you get as much "context" as you have time for. Once Mickey Mann fesses up and obeys the court order to release the public records he holds, they contain some extra "context" which he has spent a decade refusing to show to the world. Have you read any of the emails or are you just happy to believe the "nothing here, move along" narrative pushed by the press? You claim it was an "illegal hack" but the source of the leak has never been established ( or at least made public ) despite the UKs top cyber crimes unit being put on the case within days. You are again either uninformed or willing to propagate a false claim in the hope that it diminishes the importance of what it shows. Even if it is ever proven to be a "hack", no one has ever claimed that the emails were faked or tamper with. The facts are there for the world to see. "Hide the decline" clearly states how Prof Phil Jones cropped off the inconvenient down turn in Kieth Briffa's proxy data , which showed that tree rings are not a reliable proxy for temperature. He then grafted on the the recent thermometer record , using the same line style and colour. That was scientific fraud, no questions, no way out.He admitted that is what he did. That was the graphic which got onto the front page of WMO annual report and got everyone crapping themselves about global warming. But of course you are going close your eyes to that because it was revealed by a "hack". Phil Jones also refused to give their data to Steve McIntyre saying "why should I give my data you only want to find something wrong with it". A laughable but telling response. Well that is how science is supposed to work, by independent validation. He later discusses "hiding behind intellectual property rights" if the UK FOI commissioner decided he had to release it. How much "context" do you want? The so-called inquiries you refer to were a farce: simply the scientific community circling the wagons to save their own reputations. Mickey Mann was even allowed to write the questions he would be asked during the "investigation" into his misconduct. What a joke! Do you think that "exonerates" him? The UK inquiry into the part UEA Climate Research Unit played was headed by .... an ex-college who had left the unit a few years earlier. How likely is that to be an objective and probing inquiry? So after a decade of obsessing about the one day in the year September minimum as the "canary in the coal mine" we now are supposed to forget all about that and switch to worrying about January. When that does not work, I suppose we'll have to worry about ice extent in May. When the Arctic does not work: oh look what is happening the Antarctic. Constantly having to change the preferred criteria of reference is not a very convincing way to prove a point. If you want to consider ice volume instead of area/extent, the only reliable record is the CPOM extraction from Cryosat2 data, which I previously linked,yet you ignore. That does not show a decline. In fact it showed 65% increase from October 2012 to October 2013. A minor miracle which the press resoundingly ignored and most climate worriers are sadly unaware of. 2012 was the lowest summer extent on record. That massive rebound and the continued recovery since, pretty much destroys the claims of more open water absorbing sunlight leading to more melting: the assumed positive feedback which was supposed to lead to unstoppable run away melting. Nature's editor in chief decided a few years ago that they would no longer publish any papers containing material questioning the AGW narrative. No question of judging papers on the merit of their content, just ban anything you don't like. How clearer an indication could you have of a determined effort to block objective science, if the Machiavellian gatekeeping revealed in Climategate emails was not clear enough for you. This warming period we're in now is unprecedented in the rapidity of its onset. There is no way to reliably make such a claim since the proxies which go back tens of thousands of years do not have sufficient time resolution. If you only have a data point every couple of hundred years ( and it's millennia as you go further back ) you have no way of detecting whether changes happened as quick as we see in the last few decades. What about the rapidity of the onset of the early 20th c. warming. That was just as quick but the IPCC says human emissions were only significant from about 1960 onwards. You need to close your eyes to that inconvenient truth as well. There is an "industry" out there and it is churning out dubious, partisan claims at the rate of thousands of papers per year. Who, on the receiving end of the billions of dollars of funding is going to want to publish a paper saying warming is unlikely to be a problem? There are a courageous few, but they get ostracized, refused publication in high visibility journals and sacked. Bad for business. I criticise scientists making claims of unwarranted certainty as well as hypothetical waffling full of suggests, maybes and couldbes in place of clear scientific findings. That is not contradictory. Both are bad scientific practice. The average man in the street may not have much science training or understanding but most have enough smarts to recognise the smell of bovine excrement when it is slapped in their face. Sadly academics are so full of hubris and contempt for the rest of society that they seem unable to realise that. They seem to think that if they keep on cranking up the volume and exaggerating further, finally everyone will believe them and let them run the world.